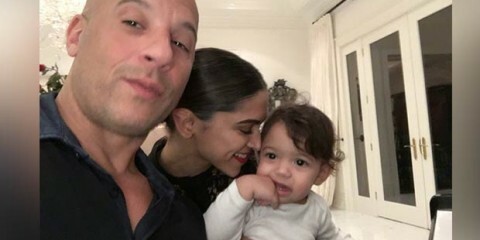 Photo Alert: Deepika Padukone’s Adorable Moment With Vin Diesel’s Daughter! The Kardashians and Jenners are always setting the trends, not following them. They were one of the first on the cotton candy pink hair train, & now even baby Dream is rocking pink locks! See pics of the *pink ladies* right here! Kylie Jenner, 20, is always changing her hairstyles, trying out rosé pink hair in the fall, and switching things up with a hot pink wig for Coachella! She and her sisters aren’t afraid to go bold with their beauty, and pink hair is certainly no exception. Kylie shared her first go at pink locks in December 2016, when she seductively posed with a snake in her hand and wet-look pink hair. A part of her racy shoot with Terry Richardson for her 2017 calendar, Kylie didn’t stop there working with the color pink! In Sept. 2017, when she was just posting close-up selfies and hiding her pregnancy, Kylie shared a picture of herself with rosé long hair and, we’re not going to lie, it totally worked for her. And, who can forget her hot pink fringe at Coachella this year?! 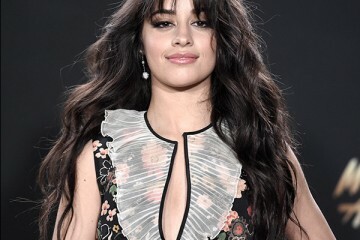 That was a look! See the Kardashians and Jenners rocking pink hair, here! 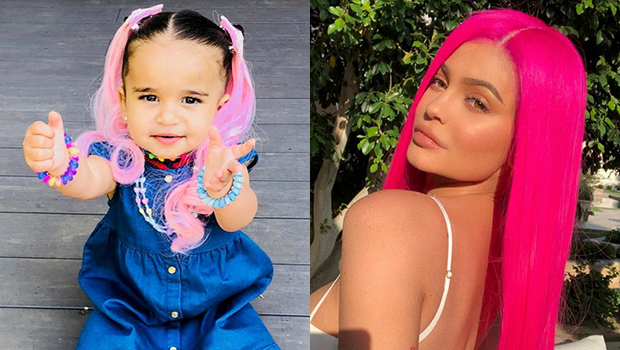 Kylie clearly inspired her big sis Kim Kardashian, who went pink in March 2018! Except Kylie wasn’t her only inspo, as Kim shared on Twitter of her new look, “I am obsessed with anime. That was legit my inspo.” The KKW Beauty and KKW Fragrance mogul showed off her new pink hair during a trip to Tokyo with her sisters Kourtney and Khloe, and only recently returned to her natural dark hue. Now, Dream Kardashian is jumping on the pink hair trend! Her mom, Blac Chyna, shared the cutest photo of the 17-month-old wearing hot pink pigtail extensions. Of course, Chy was trolled by mom-shamers for allowing her young daughter to “wear extensions” — even though they were made for children’s play — and she ended up deleting the photo. Dream isn’t the only Kardashian kid who has rocked pink in the hair, so don’t take the trolls to heart, Blac. Kourtney Kardashian’s daughter Penelope Disick had some hot pink put into the bottom of her hair and it amped up her kid-friendly trendy style! Let’s not forget about Khloe and Kendall, who also rocked pink in their hair and totally pulled it off! Go through the gallery above and check out all of the Kardashians’ and Jenners’ best pink hair styles!